Wall Street analysts have reduced their ratings on the shares of both Dominion Energy, the lead developer of the pipeline, and co-owner Duke Energy. And Dominion said earlier this month that while it still expects the pipeline to get built, it won't contribute to profits as soon as predicted. 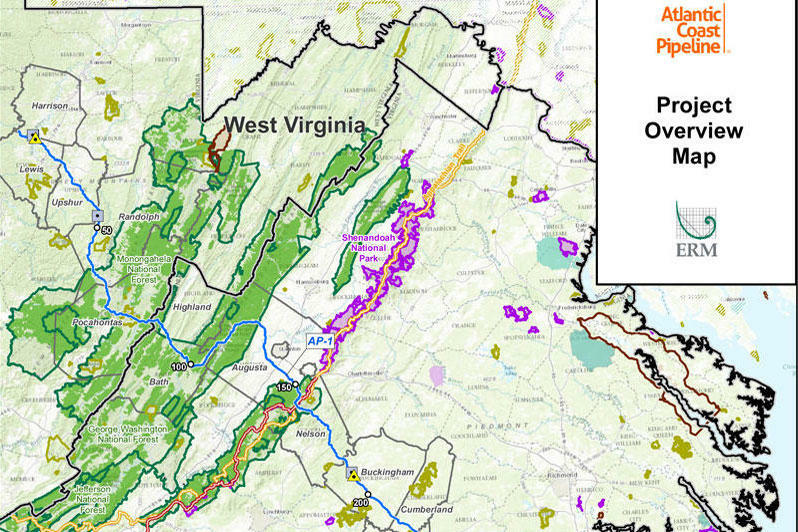 Map shows the route of the Atlantic Coast Pipeline. The 600-mile pipeline would carry fracked natural gas from West Virginia to Virginia and eastern North Carolina. But construction is on hold because of rulings last month by the federal appeals court in Richmond, Virginia. The court issued a stay of a critical U.S. Fish & Wildlife Service permit and invalidated a U.S. Forest Service permit. Both are needed for work to proceed. Nothing will change until at least March, when the court hears Dominion's appeal on the Fish & Wildlife permit. And Dominion says it's also planning to appeal the Forest Service permit ruling. The Fish & Wildlife permit would allow the pipeline to be built in areas that could threaten endangered species. The Forest Service permit authorizes the pipeline to cross two national forests and the Appalachian Trail in central Virginia. Duke hasn't said how the delay might affect profits. A spokeswoman says the company is disappointed and will give an update during its quarterly earnings conference call with analysts on Feb. 14. Dominion also promises a financial update when it reports earnings Feb. 1.